SI On Campus says that these are the top 15 college football plays of all time. I don't think they are in any particular order. Lindsay Scott! Lindsay Scott! Lindsay Scott! Nice to see that Lindsay Scott made the list; not sure about that Seneca Wallace play or even The Bush Push (I would argue that the 4th & 10 conversion was bigger in that game). How did they do? What did they miss? Billy Cannon(LSU-Ole Miss 1959)? Roy Williams (OU-UT 2001)? David Pollack (USC-UGA 2002)? What is the best play in the history of your school? It never made the highlights but it was the most fundementaly sound option play I've ever seen. 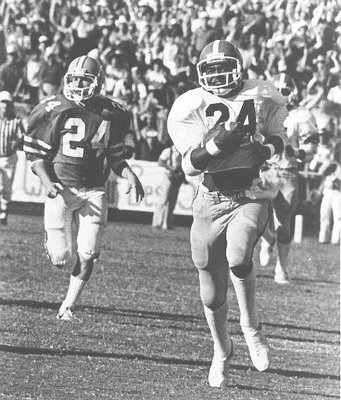 Colorado v. Nebraska '89 at Boulder Darian Hagan was the quarterback(I believe) Eric Beinime the running back(I think). The triple option was ran to perfection, a fake on the dive, a fake on the pitch and Hagan was on the run for a 70 yard touch down. 10 to 15 yards before paydirt a "BLACKSHIRT" came a'flyin'. The back never broke his assignment and stayed 4 yards off of his Quarterback, his wingman, if you will. Hagan never looked and just flipped the ball as he was creamed and the Buffs scored as the back walked in to get the scoring started and the route was on. You are spot-on, Brain--that play was amazing and no one remembers it. It was a big game, too--both teams were 8-0, and the win cemented Colorado's reputation as a player in the NC race that season (they lost the Orange Bowl to ND as the #1 team in the nation). One of the funniest things about that play is that it was, statistically, a 70-yard TD run for Bienemy, even though Hagan did all the work. I'm not sure I'd call it a "route," though--I think Colorado won 27-21 (I think that play made it 21-0, and Nebraska came back toward the end). For the record, this list is stupid as hell. What about OJ's run against UCLA, or Cannon's punt return? Oh, that's right, much like Leinart-to-Jarrett on 4th and 9, they don't have some sort of "name" attached to them, and are thus apparently up against it when it comes to inclusion. At least they had the decency to put Teague's play in there.